Latest researches show with an abundance of evidence, that modern religion (including Christianity) are evolved from primordial believes system as a reflection of its social and political structure. Following this concept, one could draw an evolutionary tree (in the attached picture) that would depict Christianity (and other modern religions) as a descendant of shamanism. In practice, it is argued that religion is a product of human society, evolved over time, and not a product of divine intervention. How would you object to this thesis? In practice, it is argued that religion is a product of human society, evolved over time, and not a product of divine intervention. 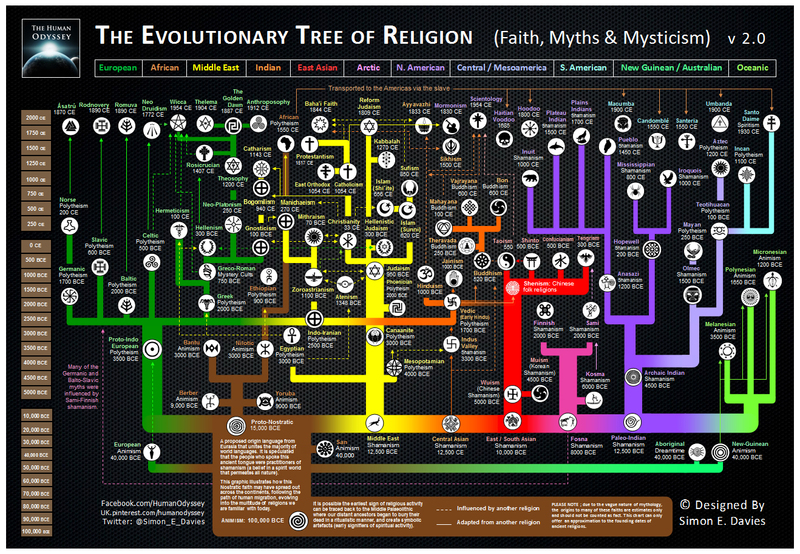 The evolution of religions as shown in the diagram is predicated on the assumption that none of the religions depicted are actually true. In other words, Judaism can only be said to have 'evolved' from Caananite polytheism if there was no actual God who revealed himself to Abraham. Christianity can only be said to have 'evolved' from Judaism if there was no Jesus of Nazareth giving a divine revelation. Also, drawing a diagram is not an argument. Anyone who presents this diagram as an argument against religion needs to explain its assumptions, what evidence backs it up, and why they think what it depicts is actually the case. I am by no means an academic, but I'll attempt to give my opinion on the matter. The majority of traits of religion we investigated exhibit a correlated pattern of character change on phylogeny. The results suggest that belief in an afterlife, shamanism, and ancestor worship evolve in concerted fashion as an integrated system of beliefs and practices. However, neither high gods nor active high gods exhibit correlated evolution with the rest of the religious traits, including ancestor worship, despite Spencer’s and Tylor’s suggestions. The paper does not attempt to explain how belief in God developed, but does note that other papers attempt to link belief in God to various social and political structures. These papers seem to only describe correlations between the two, but it has been well established that correlation does not equal causation. I would argue that academic research on this topic is far from settled and should not be taken as definitive. But again, I am not an academic, scholar or expert on this topic; this is just my perspective on the matter. 1) Some changes are due to cultural drift, invasion (by Assyria, Babylon), syncretism with neighboring peoples (like the Canaanites), corrupt kings (most of them!) or the influence of false prophets (like the Baal worshipers that Elijah fought). The Bible shows how these practices were forcefully opposed and ultimately rejected. 2) Some changes are due to additional revelation from God. These changes are remarkably consistent with what was revealed before. 3) Some changes introduce a New Covenant or a dramatic change in the mode of worship, such as with Noah, Moses, David, and Jesus. The important thing here is that such changes are foreshadowed by the prophets. As it says in Amos 3:7, “Truly the Lord GOD will do nothing he has mentioned without revealing his purposes to his servants the prophets." The reliability and great number of fulfilled prophecies is what set Judaism and Christianity apart from other religions. So I would say that Christianity stands apart from other changeable human religions in that its changes were planned by God and announced in advance, while still preserving much continuity. For example, if I read about the ethics practiced by Job, a man who lived almost 4,000 years ago, I see nothing objectionable or foreign or outdated in his beliefs. Indeed, Job, a Gentile, prophesies the creation of an authoritative book collecting God's oracles to man, he prophesies Jesus walking on water, refers to his savior as the "Son of Man", lists dozens of other historical events later found in the Bible, and even describes the beasts that figure prominently in the Book of Revelation. Not the answer you're looking for? Browse other questions tagged early-church or ask your own question. Why did Christianity survive at all? Historical evidence for a separate Jewish branch of Christianity? Did Tertullian forbid Christians from being school teachers? Is there any historical evidence that Gnosticism disappeared because Gnostics converted to Christianity?